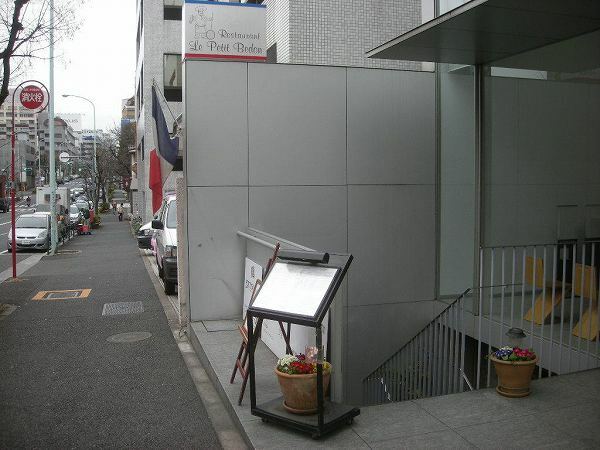 One of the most popular classical French restaurants to the French community here and local foodies is LE PETIT BEDON at Daikanyama. 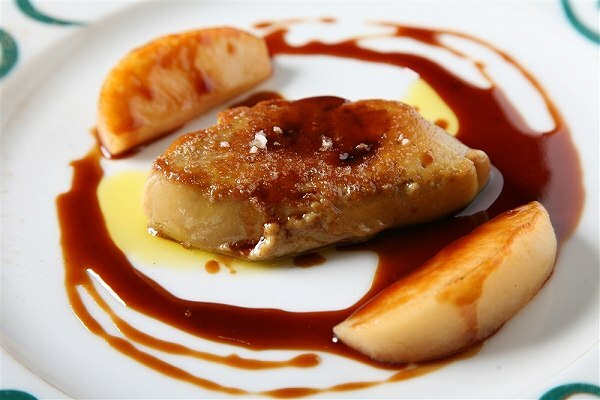 You should try one of their course menus since you can choose what you want, just like ordering from the regular menu. 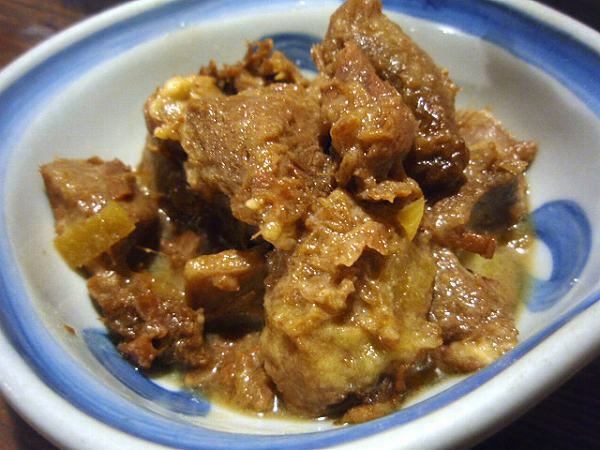 and you can ask for HOJITSU NO ONIKU RYORI (Today's meat dish), which is usually very good as well. 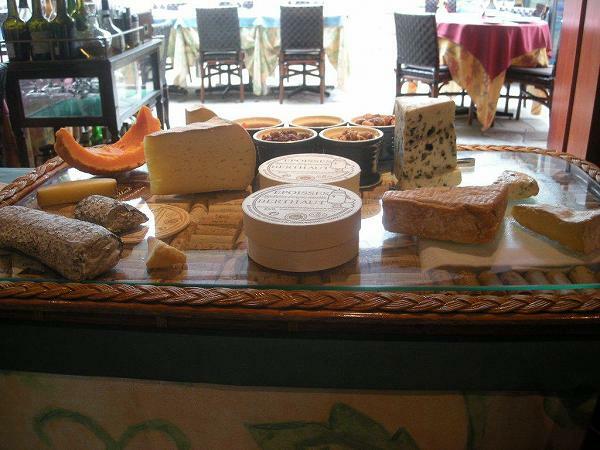 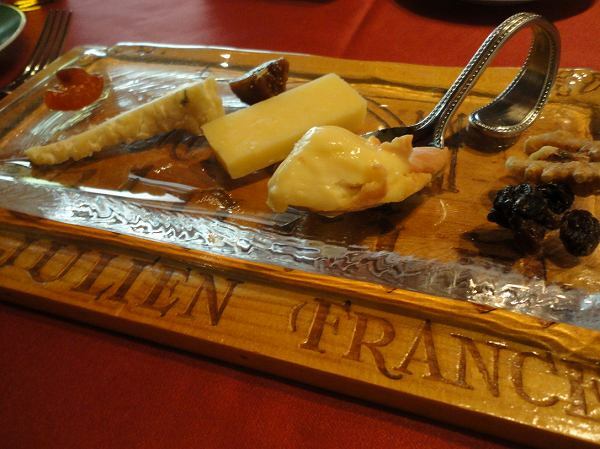 where you get to choose several cheeses. 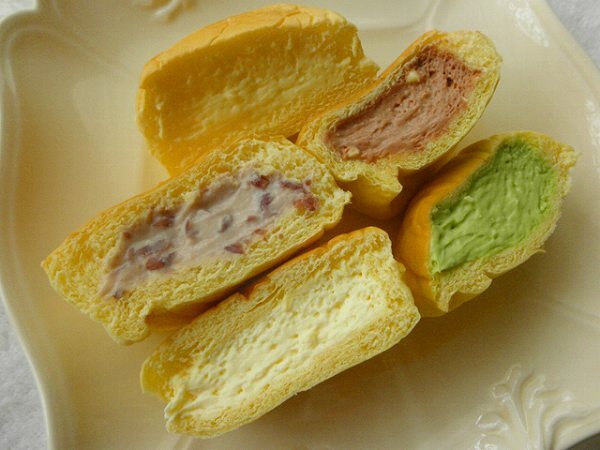 And also a desert wagon as well. 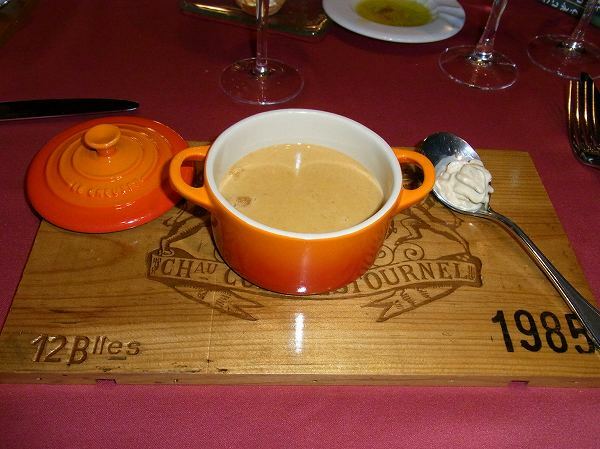 I've just listed some of their dishes, but you really can't go wrong whatever you order at Le Petit Bedon. 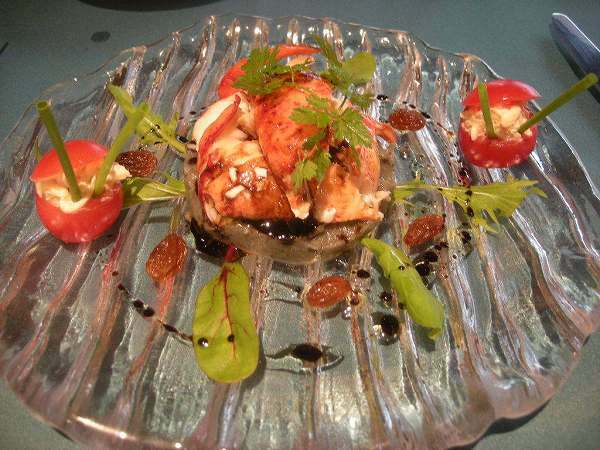 Owner/chef is French and actually owns two other restaurants in near by. 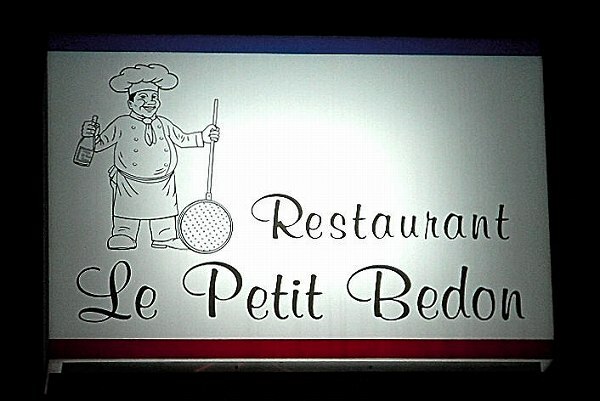 But Le Petit Bedon which is managed by his son, is probably the most popular among the three of them. 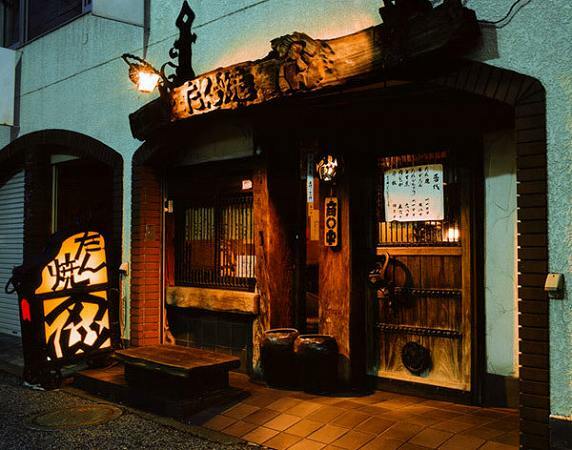 Kagurazaka is known as a trendy area where in the old days was known for its kaiseki or kappo restaurants and being entertained by geisha's during dinner. 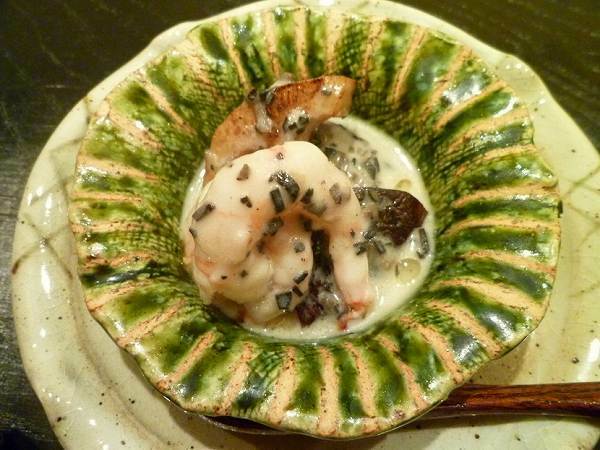 Now there aren't many geisha's, but there are still many good kaiseki or kappo restaurants. 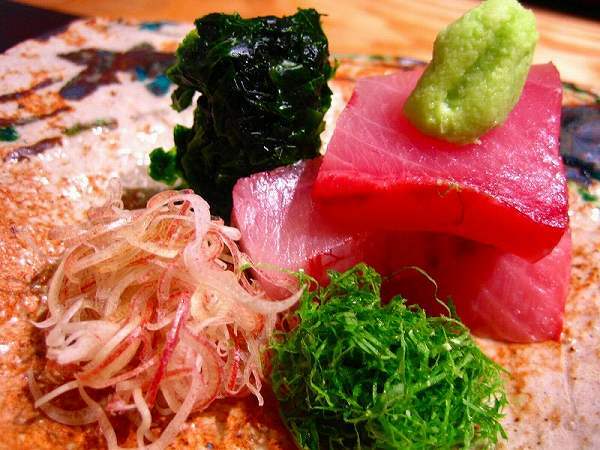 One of the new in restaurants, which is great for dates or business dinner and still affordable is KOHAKU. 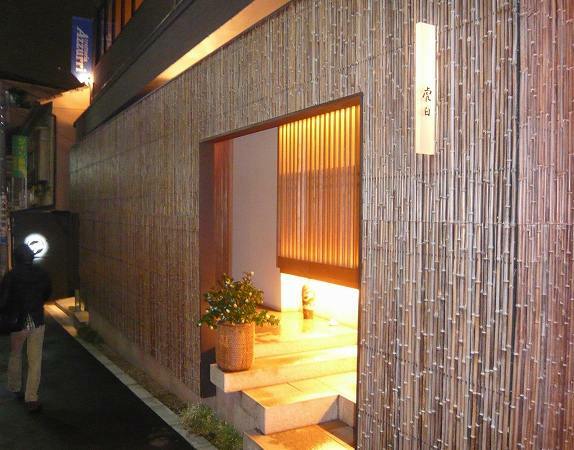 Kohaku is actually owned by Ishikawa, a Michelin star restaurant. 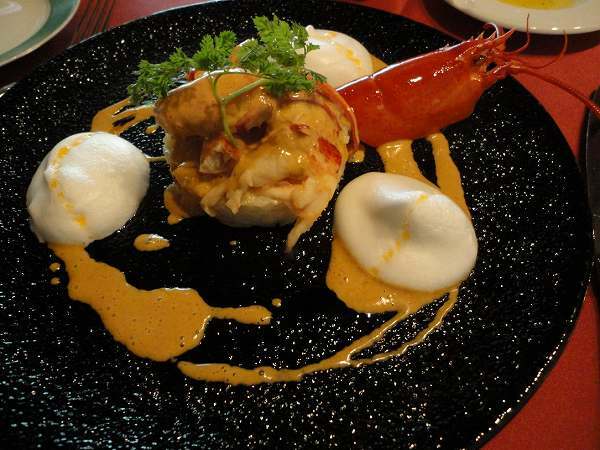 It only serves 3 course menu's for 13,000, 15,000, 17,000 yen. 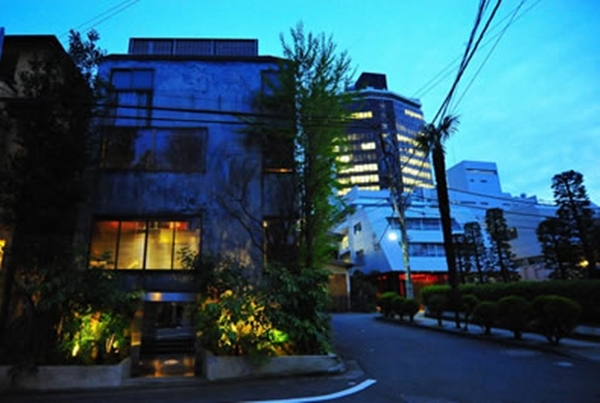 I would recommend 15,000 yen course. 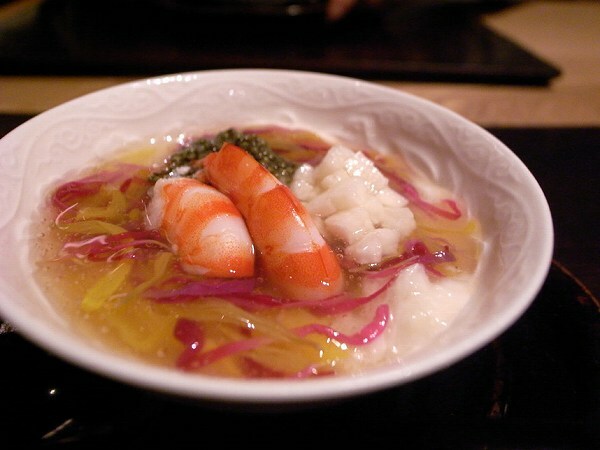 They serve kaiseki food, but some of their dishes use French or Chinese ingredients. 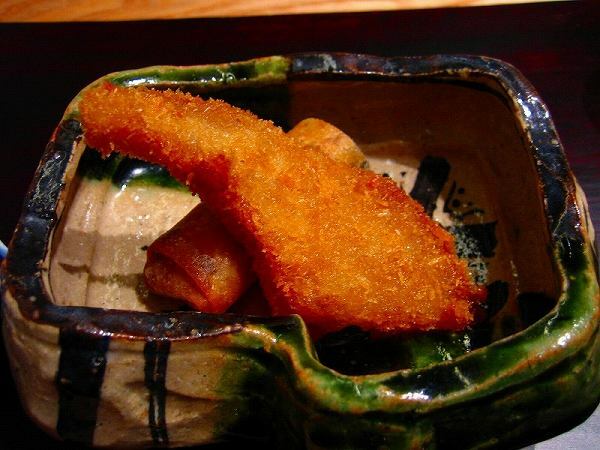 For one night, it started out with FUKAHIRE FURAI TOH SUPPON HARUMAKI (Deep fried shark fin & spring roll filled with soft-shell turtle meat). 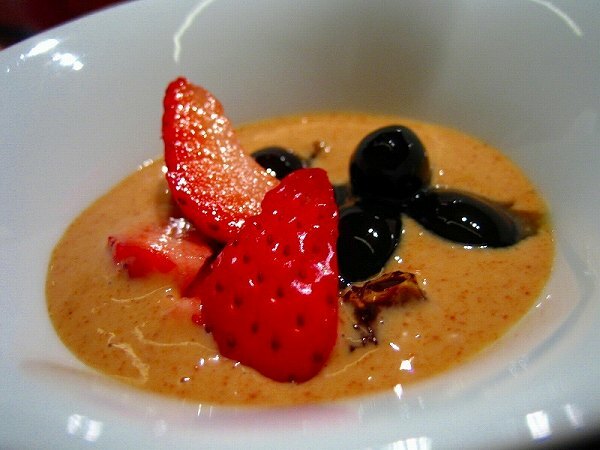 Their original deserts to finish the meal are delicious as well. 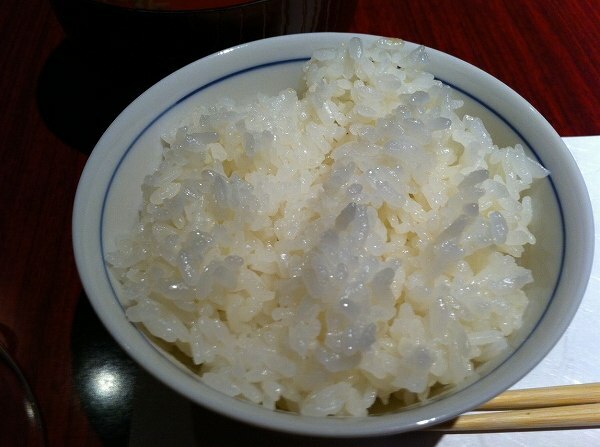 The difference between 13,000 and 15,000 yen is the rice dish. 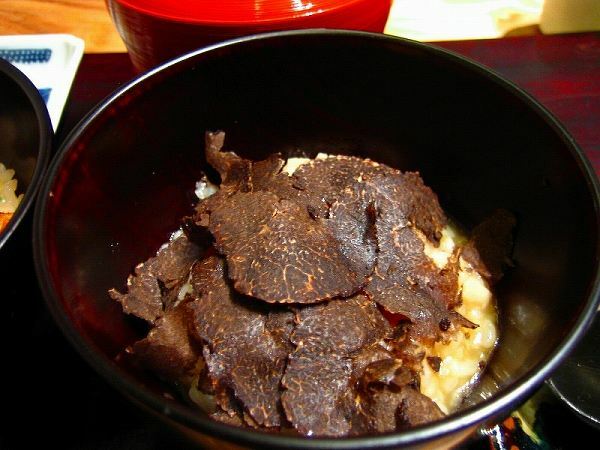 For 13,000 yen It will be rice cooked with vegetables and meat, not truffles. 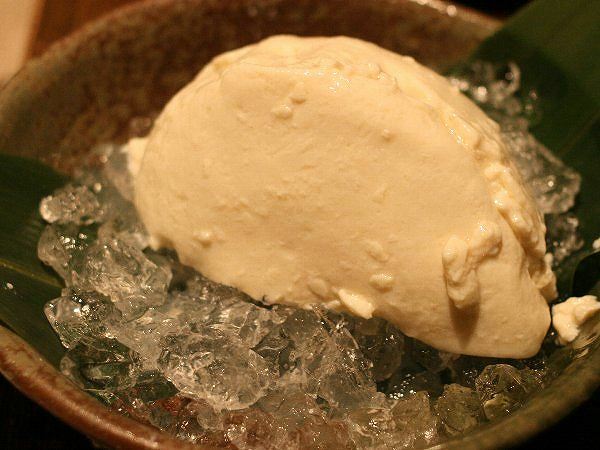 Also, Kohaku is much cheaper than Ishikawa, but half of the people I know who dine at both restaurants prefer Kohaku over Ishikawa, not only for their prices, but also for their food as well. 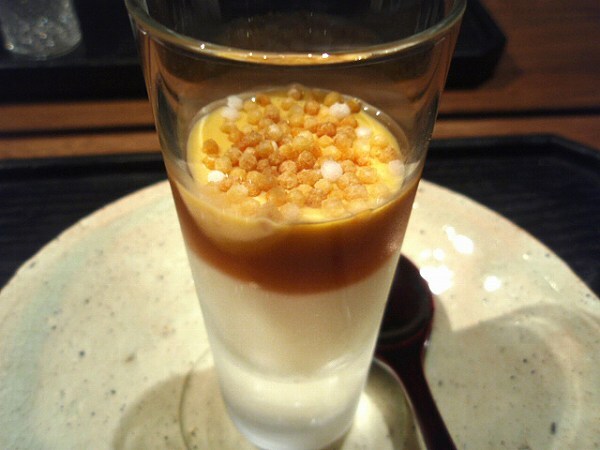 If you want traditional kaiseki food, Kobahu is not for you and might wanna try Ishikawa. 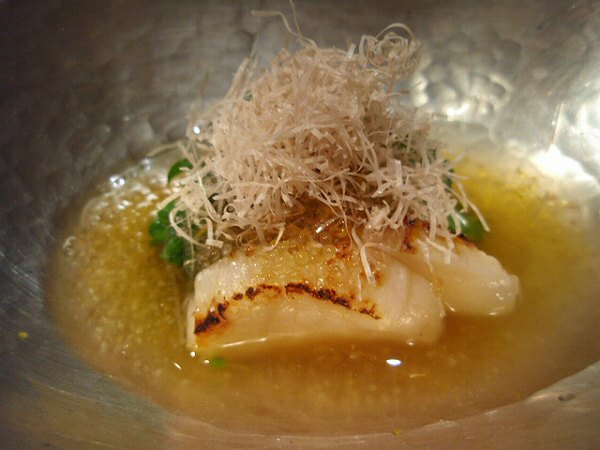 But if you are willing to check out a young creative chef, who isn't scared of using non traditional Japanese ingredients, try Kohaku. 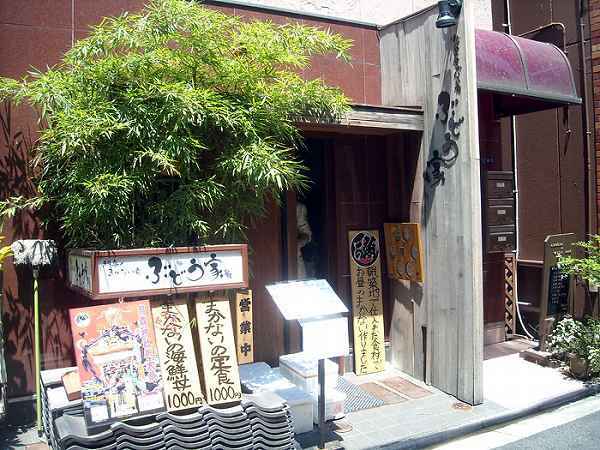 Shinbashi has many great lunch places since the area is surrounded by many small to big companies, but there is a Japanese restaurant which is probably the hardest lunch restaurant to get a seat, serving only 10 meals, opens only on Wednesday, great value and delicious is BUDOHYA. 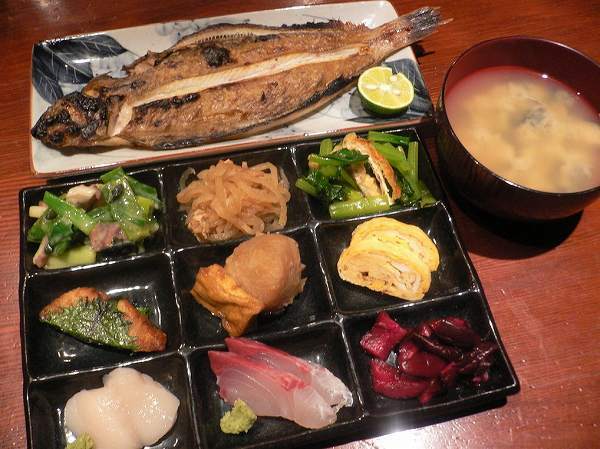 Budohya serves one lunch plate only for 1,000 yen called MAKANAI TEISHOKO (Lunch plate). 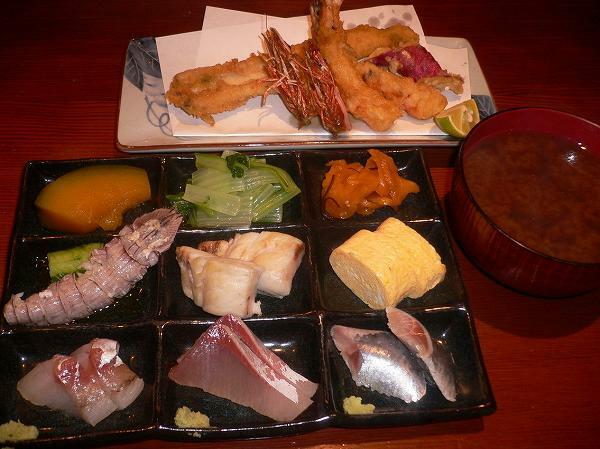 It has all you want in a Japanese lunch plate. 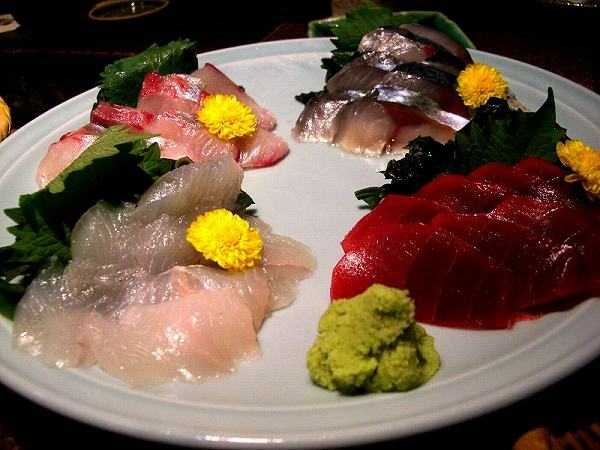 Sashimi, Dashimaki Tamago (Egg omelette), various Nimono (boiled vegetables), Yakimono (Broiled fish), and Agemono (Deep fried vegetables or fish). 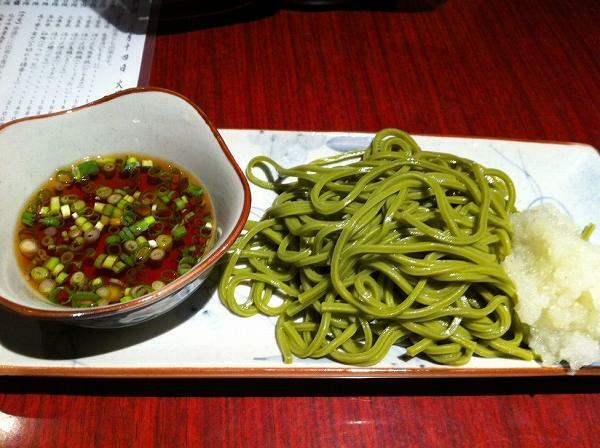 It could also be some kind of noodle at times like the above picture, which is CHASOBA (Cold green tea soba). 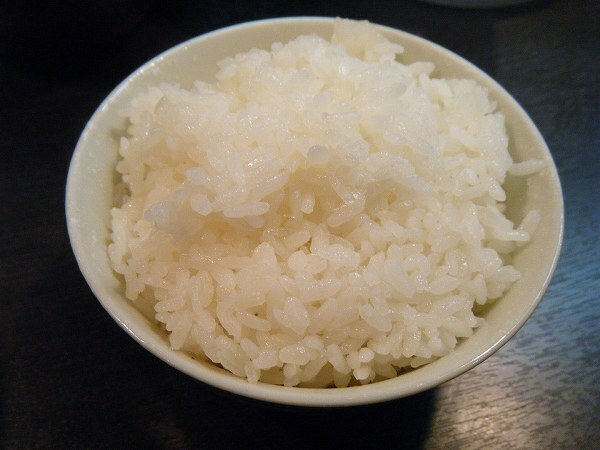 Of course, it comes with a bowl of rice, where the rice is from Uonuma, Nigata, one the top rice areas of Japan and most expensive. 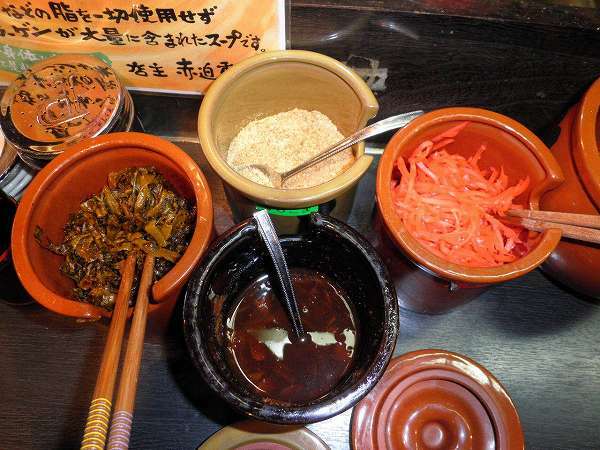 You can have extra rice, but you will have to pay an extra couple of hundred yen. 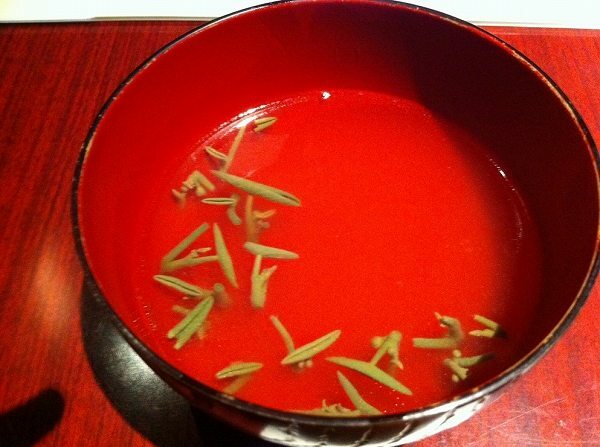 but it could be a SUIMONO (Clear soup) depending on the chef's mood. 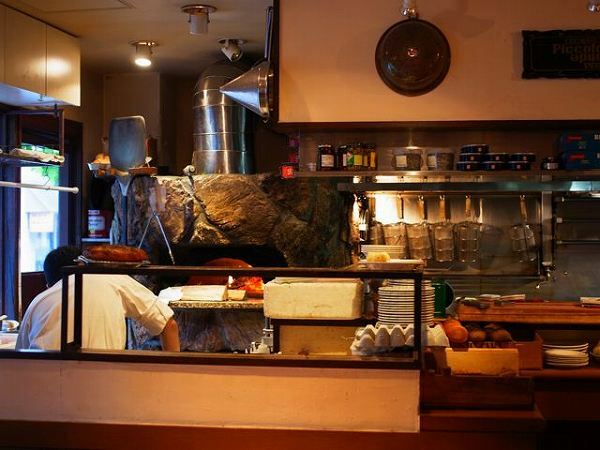 If you want to dine here, you better get here at least around 11:40 am and wait online. 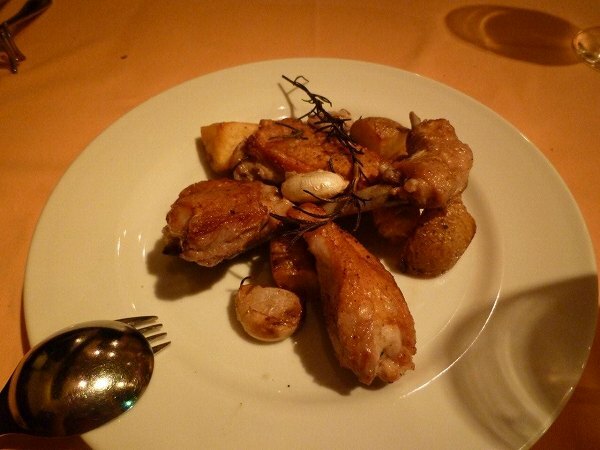 Also, they will only take singles or a party of 2. 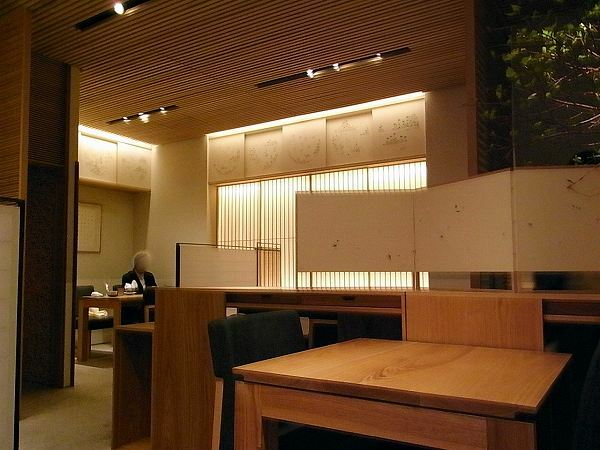 If you go there with more than 3 people and even if you don't talk to each other or split waiting online, if they think you know each other, they ask you to leave even if you get in here once. 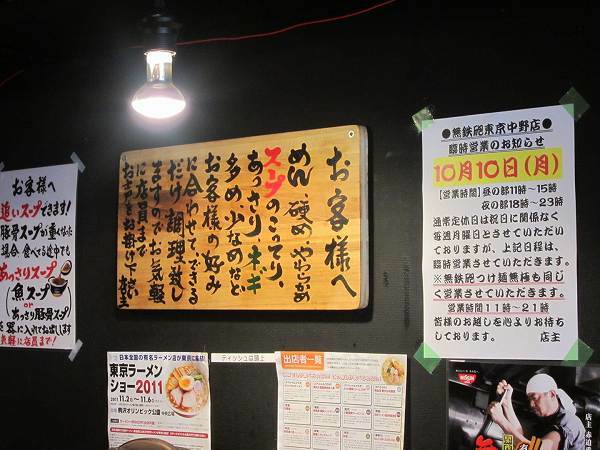 I have no idea why they have such a rule, so if you don't agree with their policy don't even think of eating here. 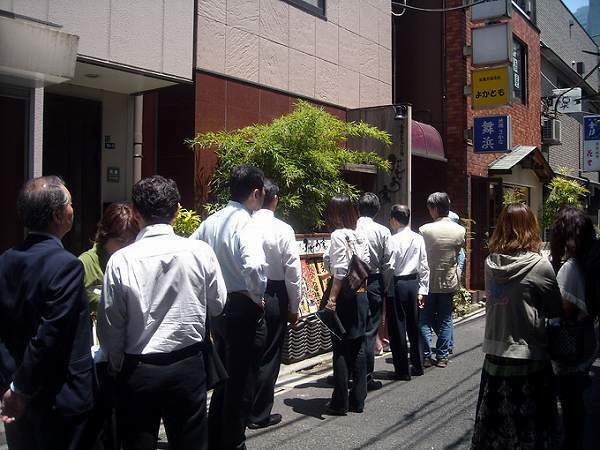 But their lunch plate is one of the best in Tokyo and no matter how long you waited online, if there are 10 people in front of you, you won't get it. 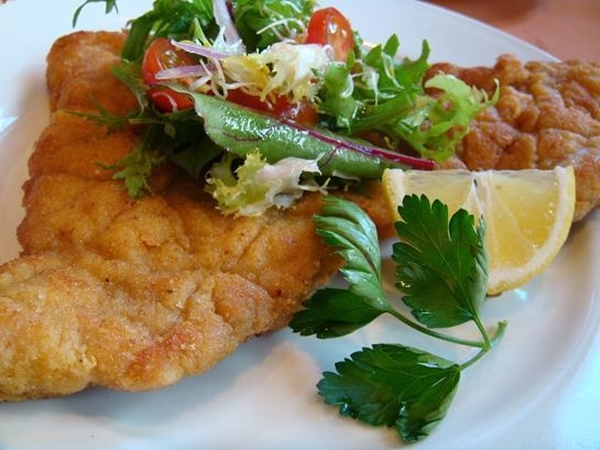 Also, it use to be opened on other days and had another dish for lunch, but its now only Wednesday with one lunch plate only. 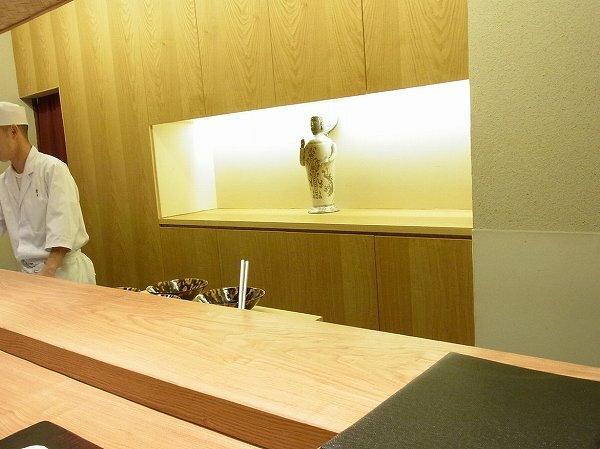 Therefore, they won't even take your order once you get in. 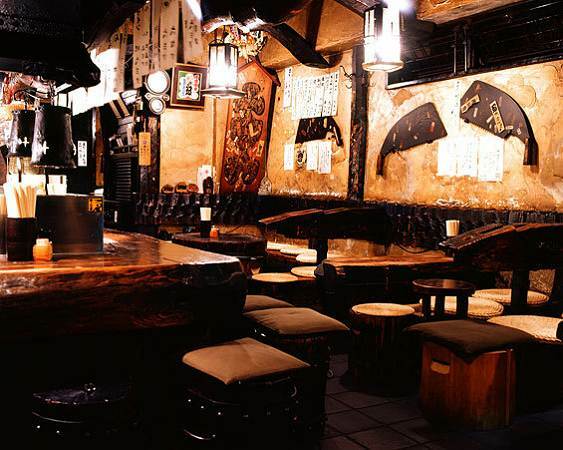 Tokyo is a bar heaven for people who enjoy drinking. 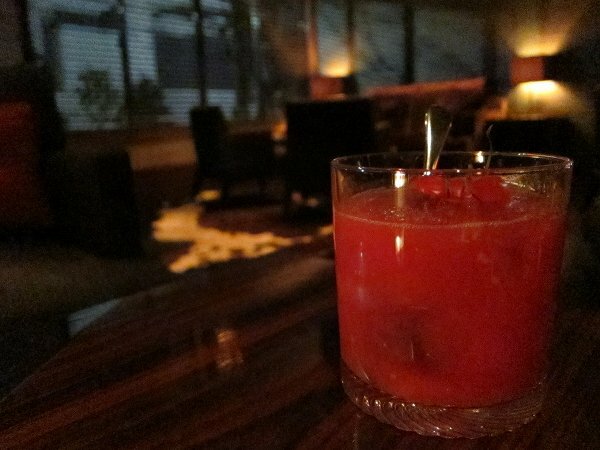 There are tons of cool bars, but the real in places aren't usually introduced on magazines or internet. 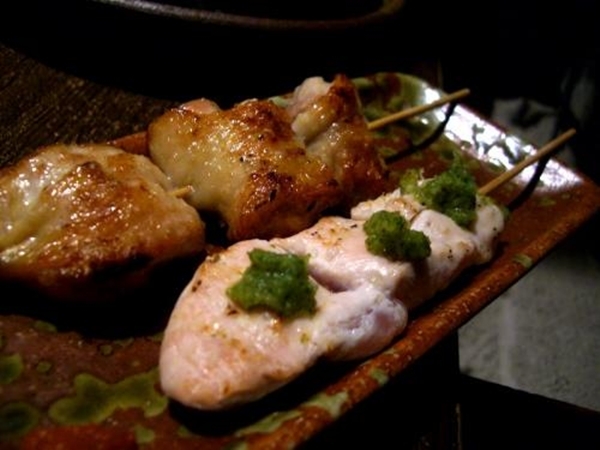 If you see too many foreigners at a bar, its either a losers joint or meat market from the hip local crowd of Tokyo. 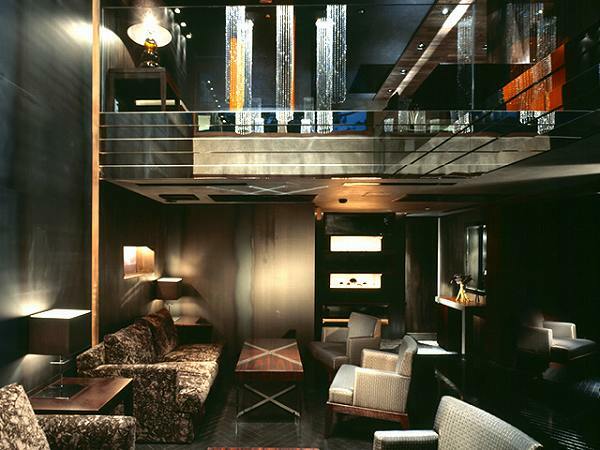 One of the relaxing bars with a private atmosphere is CITABRIA BAR, where many people from the fashion, entertainment, and media industry go to. 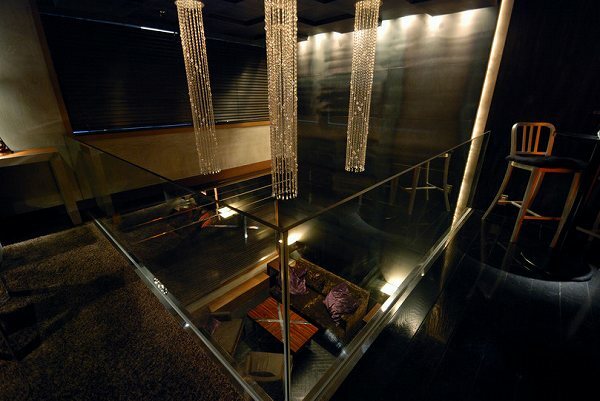 The doors at Citabria Bar aren't open. 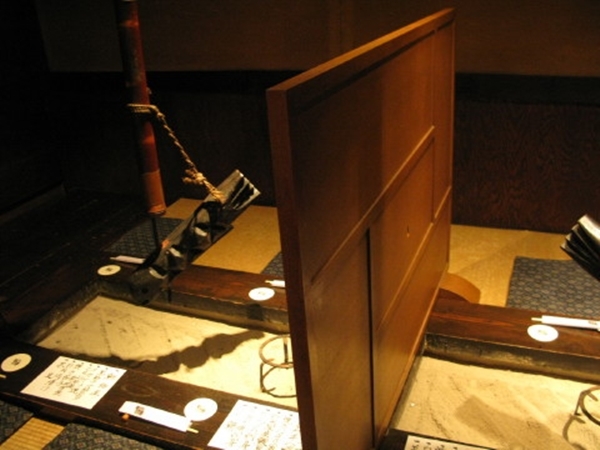 You will need to enter a four digit number to open it. 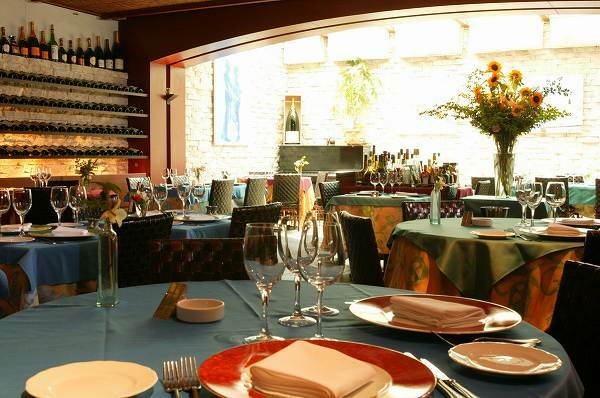 Therefore, you need to make a reservation in advance and ask for the four digit number of that night. 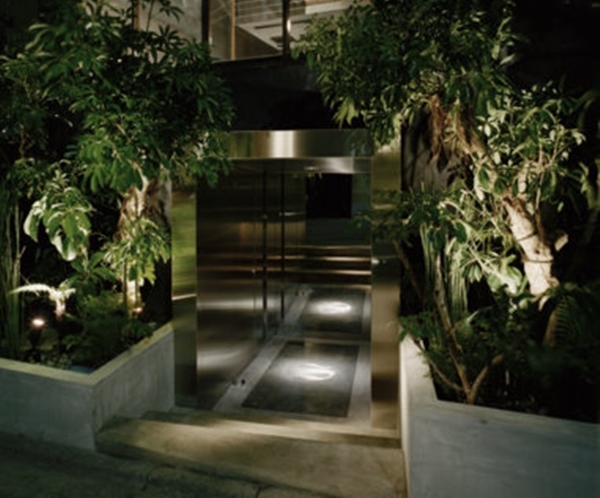 The number changes every night, so whether you are a regular or not, you will need to called them to get it in. 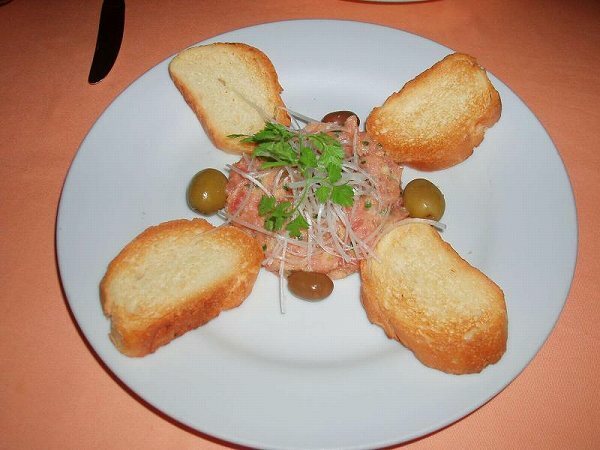 They do have a good food menu as well whether you want to have a full dinner or just some light appetizers with your drinks. 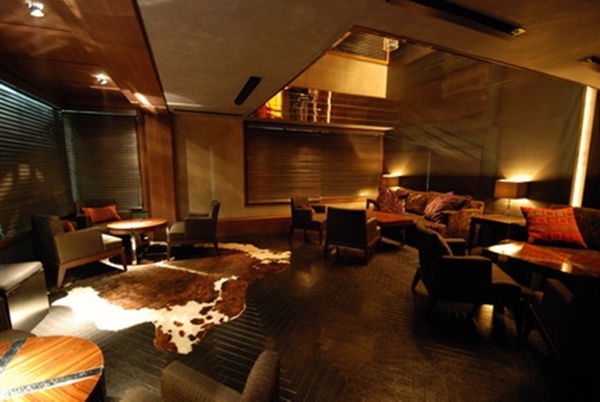 They also have a 3rd floor with private rooms, but if its your first time here I would suggest to get a table on the 1st floor. 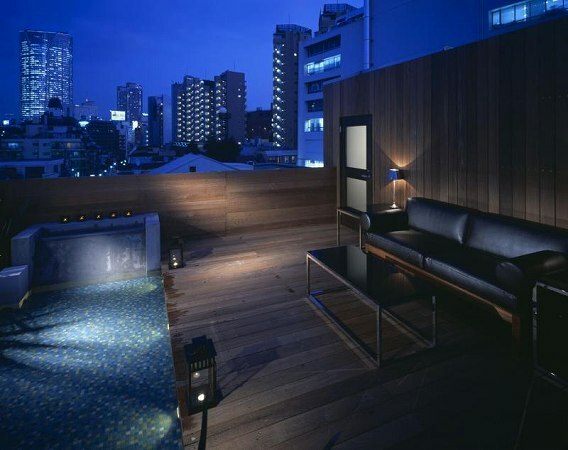 Its not a bar to go wild or crazy, but for mature adults to enjoy chatting with your friends or partner. 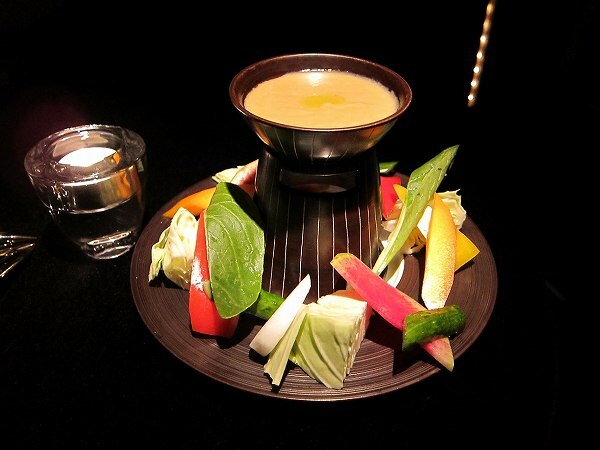 There is a cover charge of 1,000 yen per person and most drinks are around 1,500 yen. 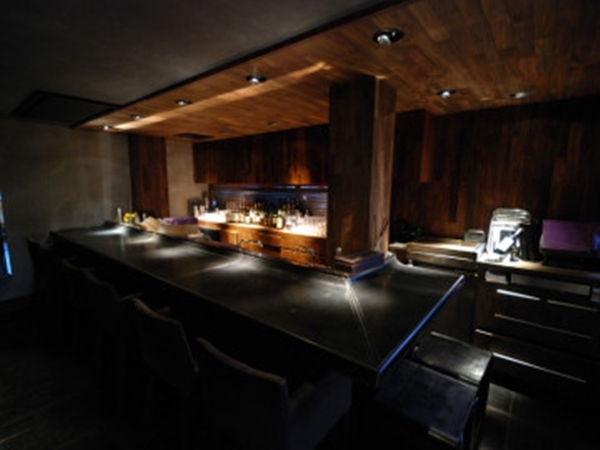 This may seem expensive, but its actually reasonable for such a top quality private bar. 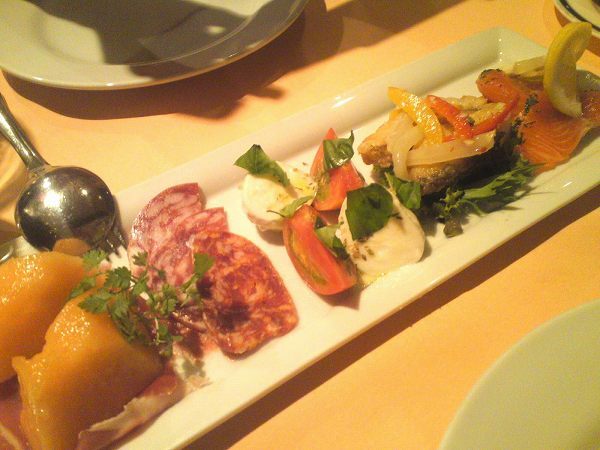 For some reason, there are many Italian restaurants in Azabu Juban area. 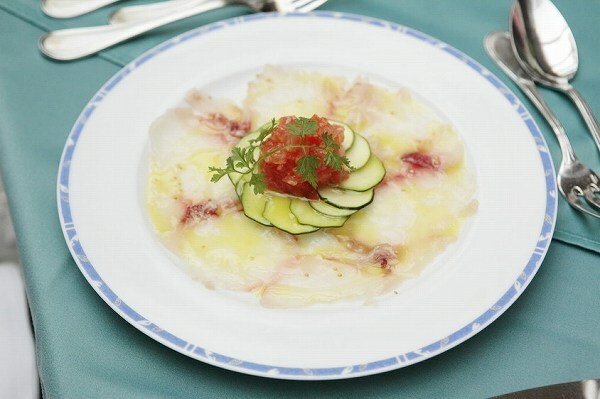 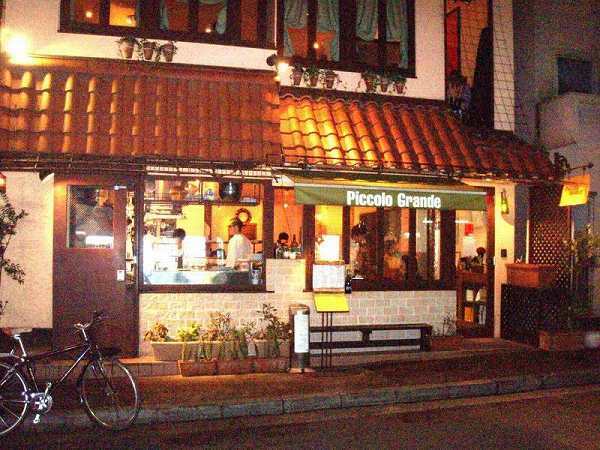 Most of them are expensive and for special use, but one of the reasonable and probably the most popular Italian restaurant in Azabu Juban is PICCOLO GRANDE. 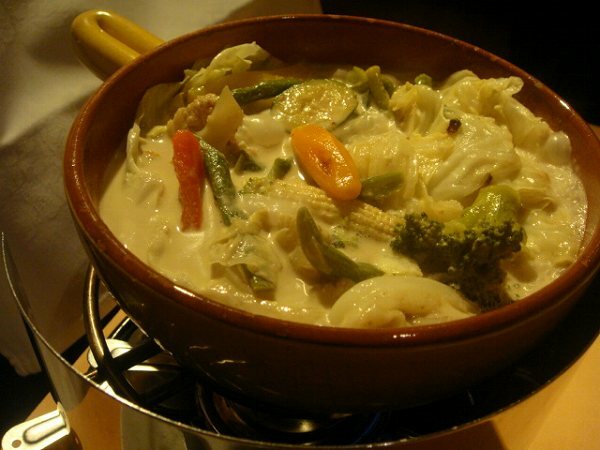 Normally with Bagna Cauda, you dip vegetables in the sauce, but at Piccolo Grande, vegetables are cooked in the sauce. 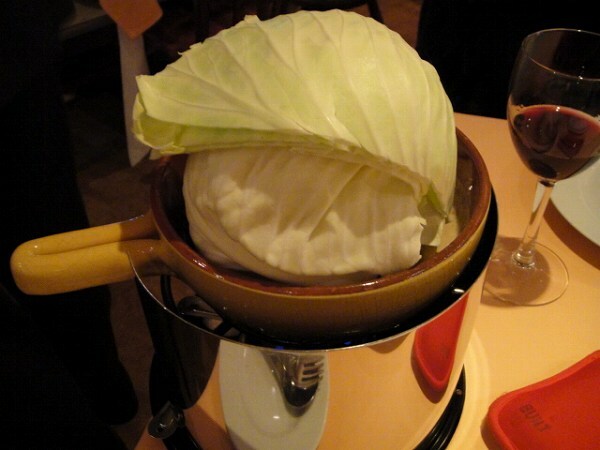 I've never seen this at any other restaurant, but its delicious. 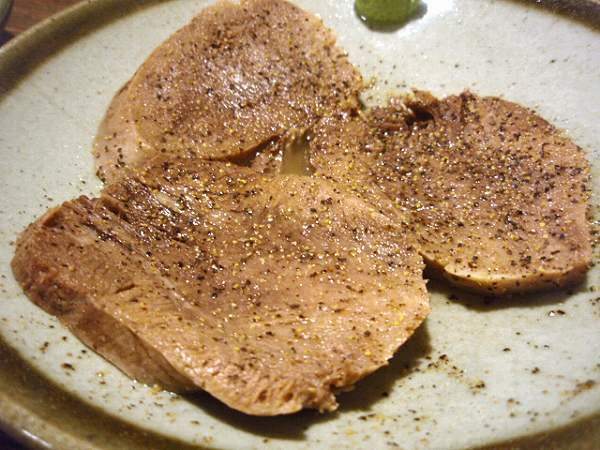 Another popular antipasto is MAGURO NAKAOCHI NO TARUTARU GARLIC TOAST ZOE (Tartar tuna with garlic toast) for 1,700 yen. 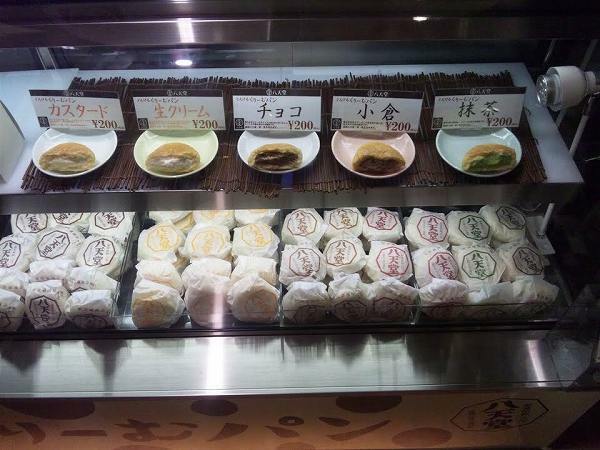 Or if you want to try various antipastos, there is ZENSAI NO MORIAWASE (Assorted antipasto) for 1,900 yen. 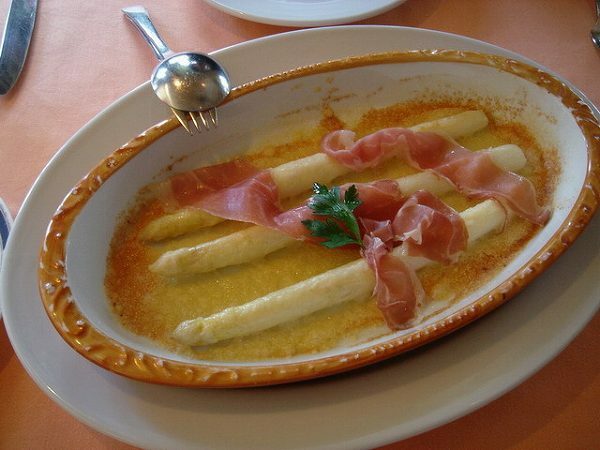 And if you happen to be visiting in the spring, one of my favorites is WHITE ASPARAGUS NO PARMESAN CHEESE YAKI NAMA HAMU NOSE (Baked white asparagus and Parmesan cheese with Prosciutto). 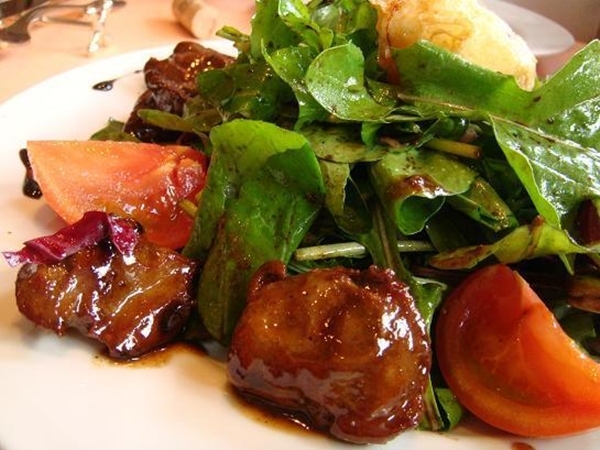 If you want a salad instead of a normal chef's salad, you might wanna try TORI SHIRO LIVER NO ATTAKAI SALAD MARSALA WINE SAUCE FRIED EGG ZOE (Warm white chicken liver salad with fried egg and Marsala wine sauce) for 1,900 yen. 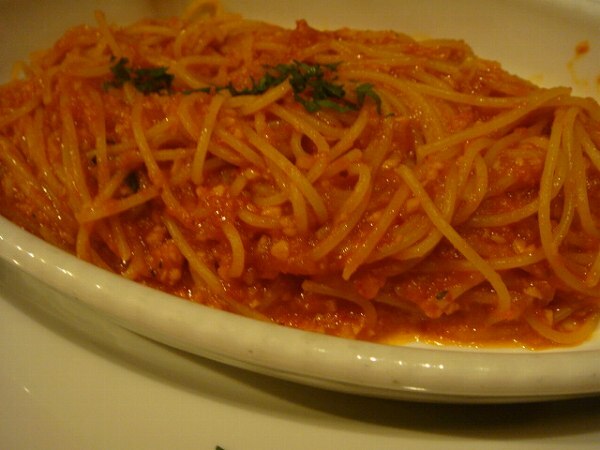 Now for pasta, some people say their SPAGHETTI ARRABBIATA for 1,500 yen is the best in Tokyo. 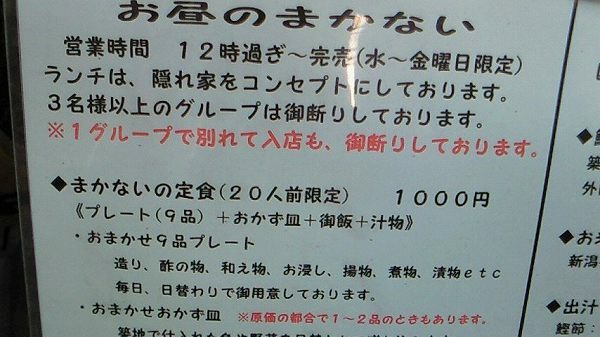 If you want to have some creamy pasta, ITALIA SAN YON SHURUI NO CHEESE TOH CREAM SAUCE NO PENNE (Penne with 4 cheeses from Italy in a cream sauce) for 1,800 yen. 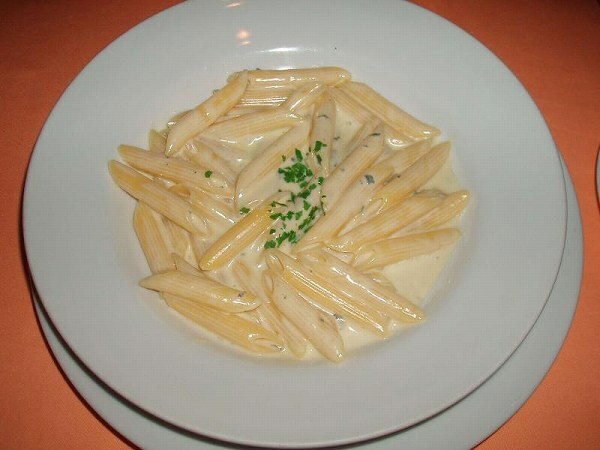 If you like pasta with Goｒgonzola cheese cream sauce, you will enjoy this maybe even more. 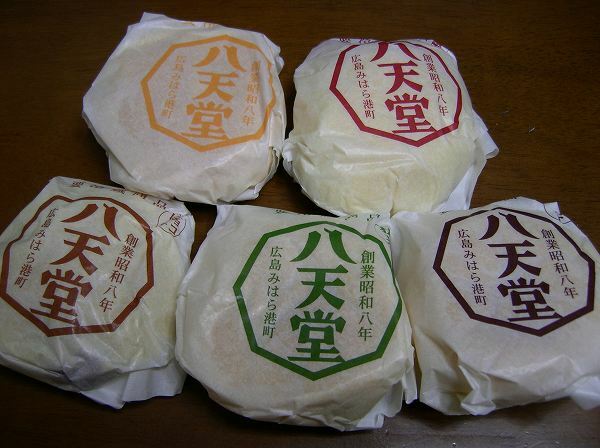 They do have pasta of day which is HONOJITSU NO PASTA and it changes by what was available at the market. 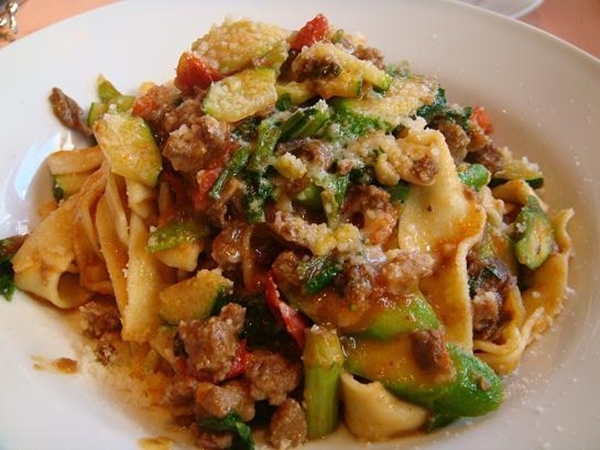 The above is Tagliatelle Bolognese with spring vegetables. 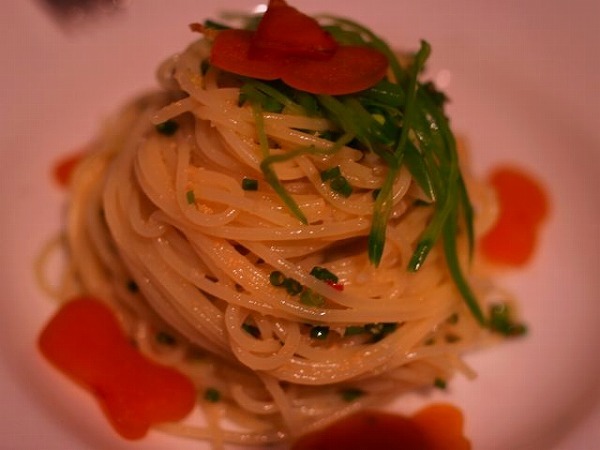 They also have cold pastas as well like REISEI KARASUMI NO SPAGHETTI (Cold spaghetti Bottarga) for 2,000 yen. 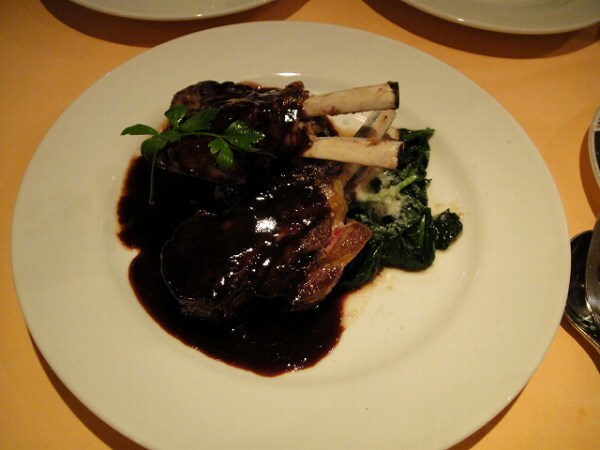 and my favorite, KOHITSUJI NO GRILL WINE SAUCE (Grilled lamb chop with wine sauce) for 2,800 yen. 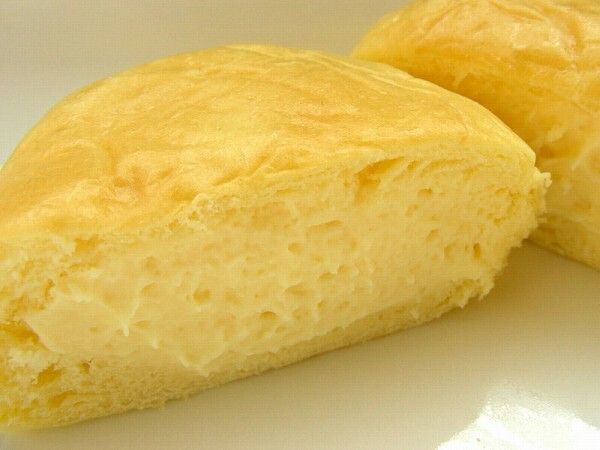 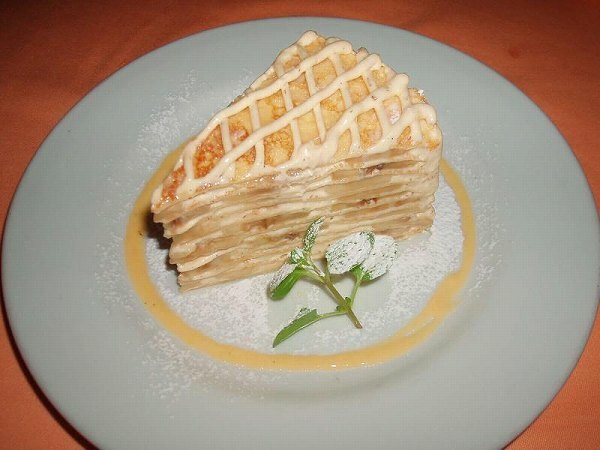 At last they do offer several desserts like BANANA NO MILLE CREPE (Banana mille crepe). 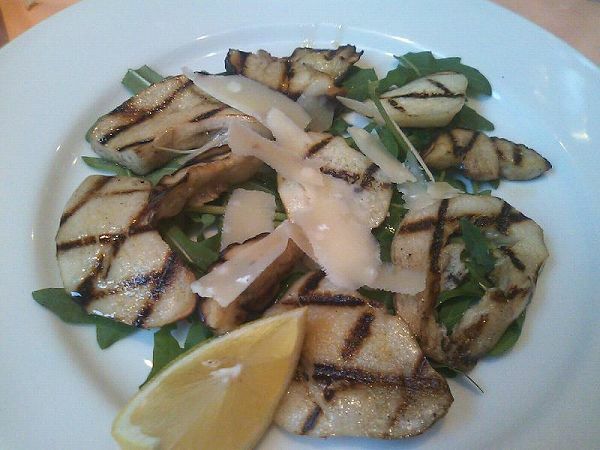 Piccolo Grande has been around since the 80's and is a casual, friendly type Italian restaurant. 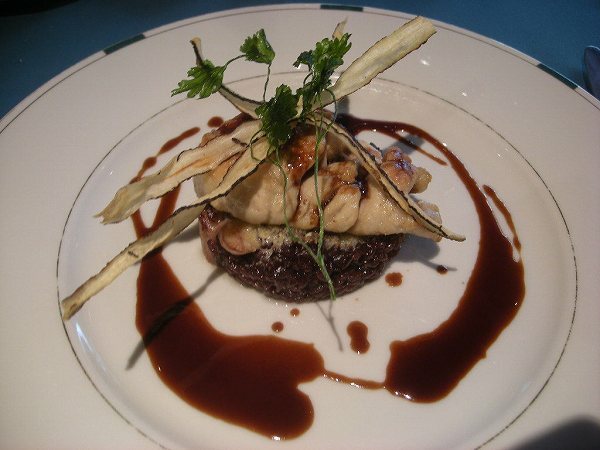 You probably won't get a table without a reservation, so make sure you do before you go. 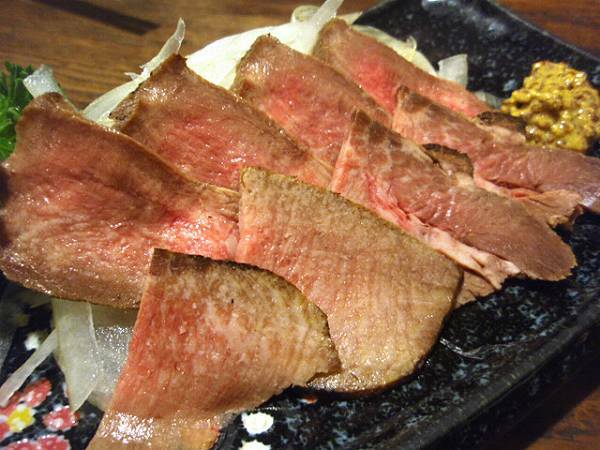 Sendai is known for beef tongue and the most famous dish is TANYAKI (Broiled tongue), now there are many Sendai-style beef tongue restaurants, but 10 yrs ago there were only a handful. 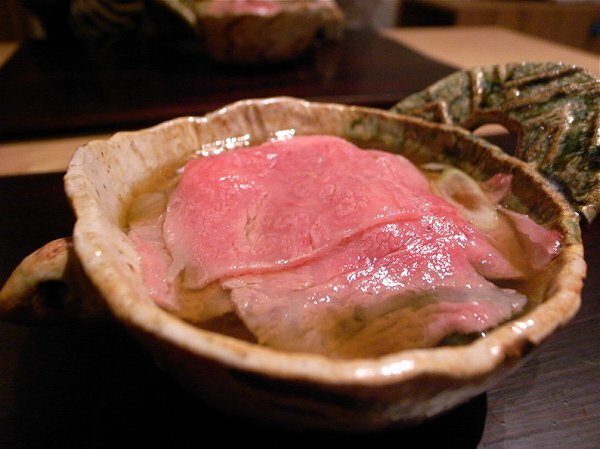 TANYA SHINOBU at Yotsuya was one of the 1st restaurants to specialize in beef tongue and is still the most popular. 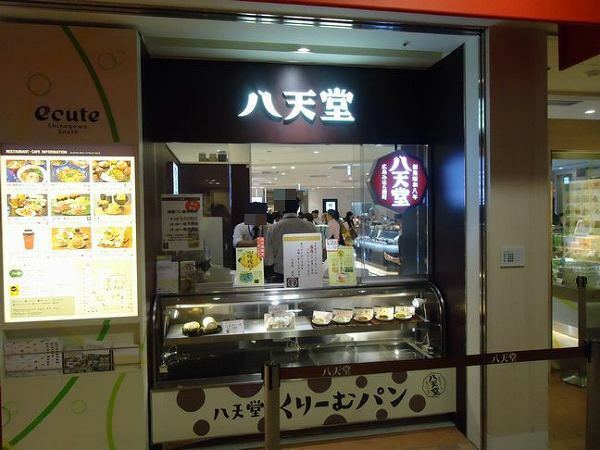 There are three must eats here. 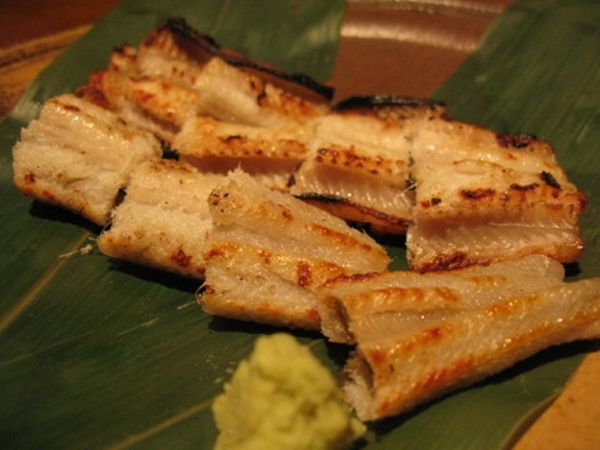 Of course, you want to order TANYAKI (Broiled tongue) for 1,100 yen. 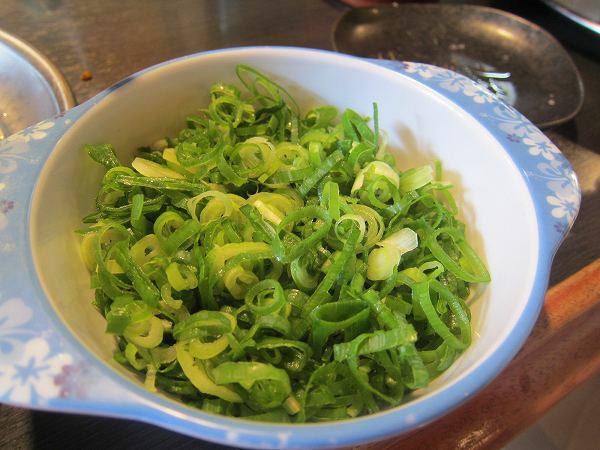 The sprinkle salt and pepper several hours before they broil it. 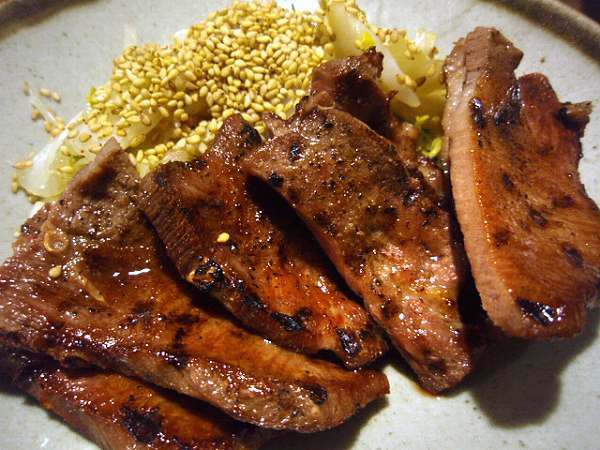 It is different from beef tongue you have at Korean BBQ. 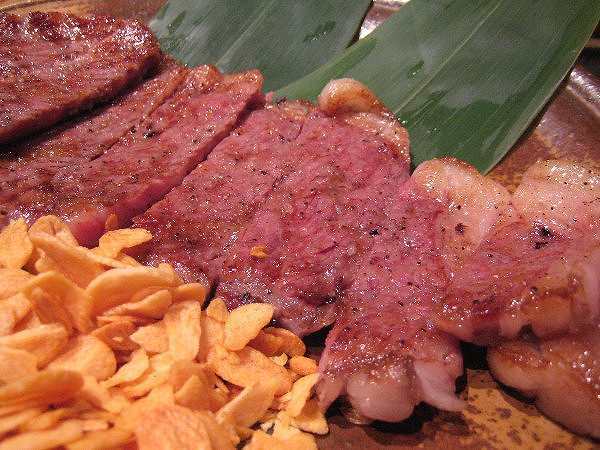 Much tastier and meatier. 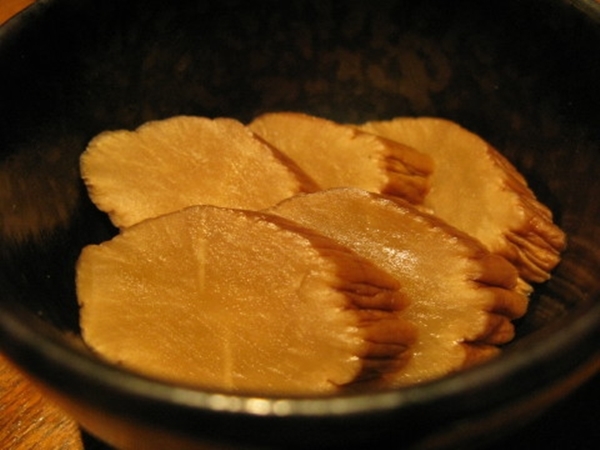 YOUDE TAN (Boiled tongue) for 980 yen. 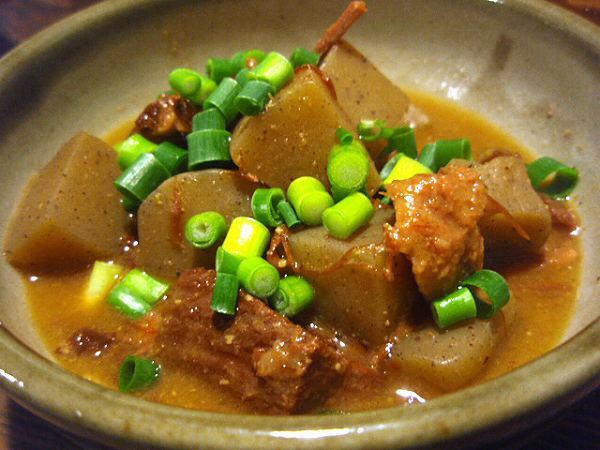 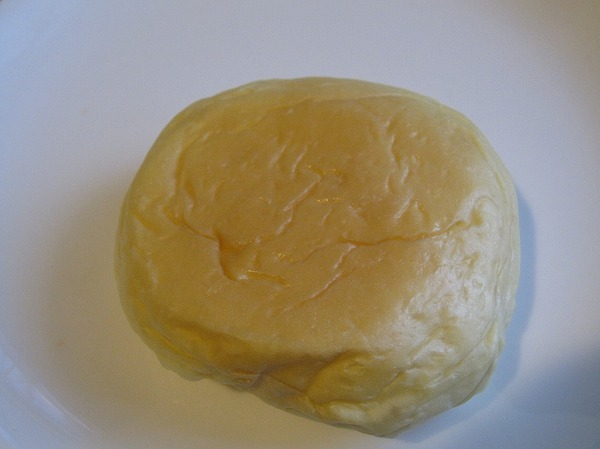 It is boiled in a clear beef and vegetable soup for several hours. 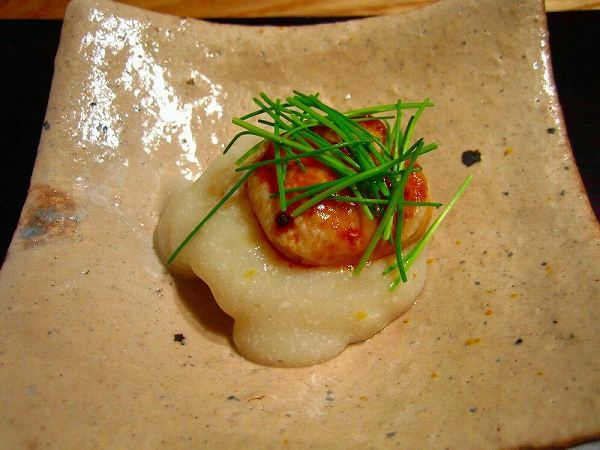 Add some wasabi on top and it is just super tender. 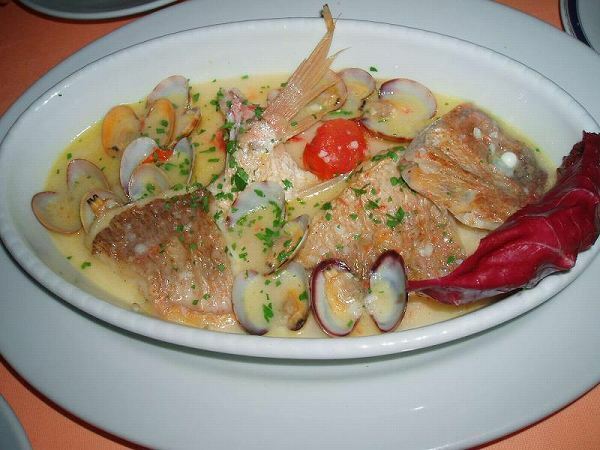 My favorite dish by far here. 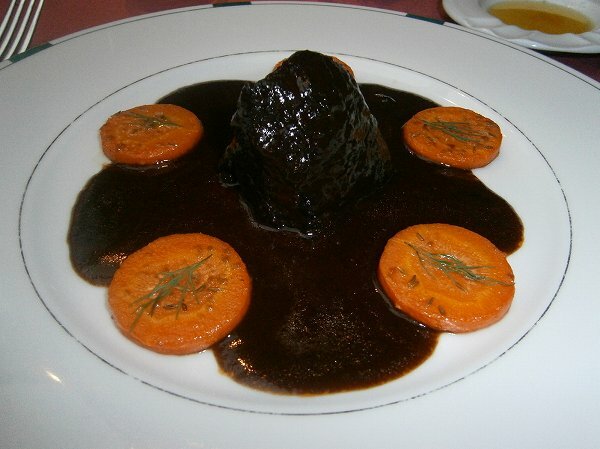 Then TAN STEW (Tongue stew) for 1,100 yen, which is also extra tender cooked in a demi-glace sauce. 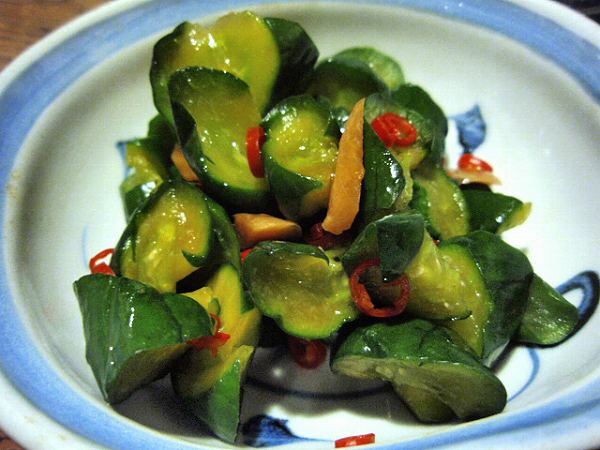 and KYURI NO NINNIKU SHOYU ZUKE (Cucumbers pickled with garlic soy sauce) for 600 yen. 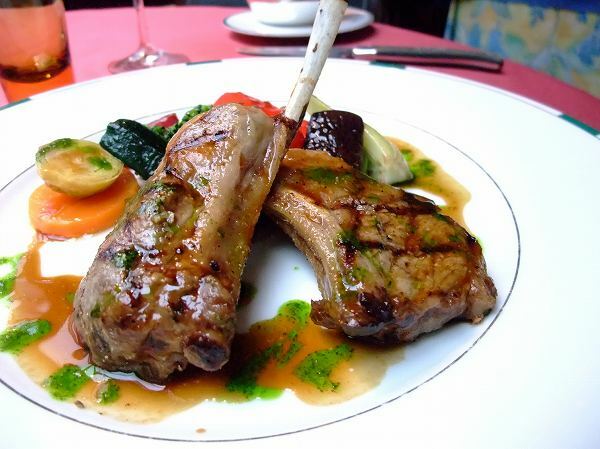 Make sure you make a reservation before dining here and even if you do, they will make you wait outside for a couple of minutes. 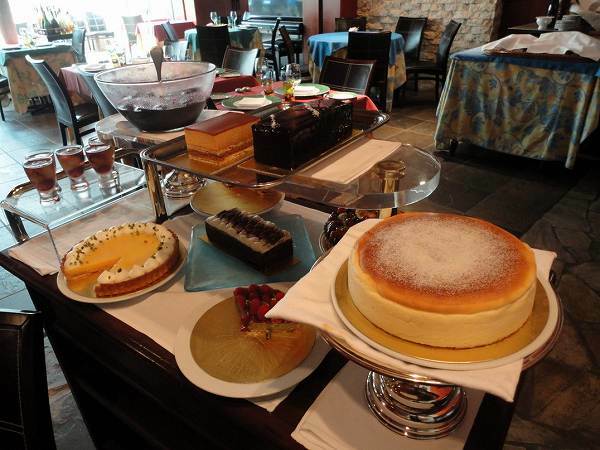 And if you don't, you can be waiting for a couple of hours. 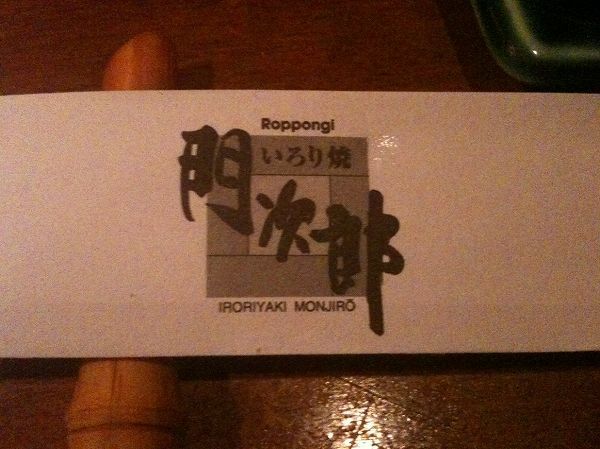 This place is more like an izakaya and its not a fancy restaurant at all. 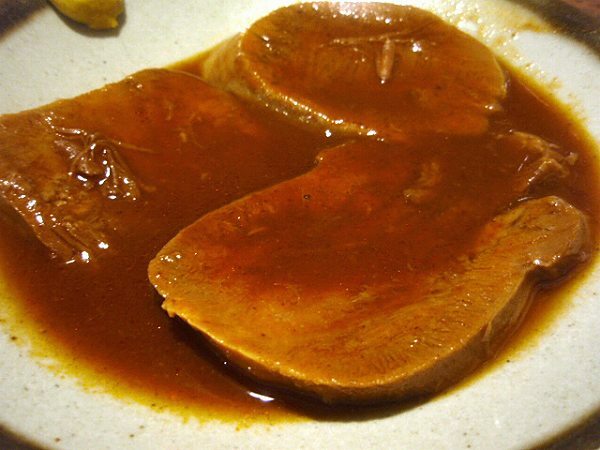 Tables are right next to each other and service isn't the best, but if you enjoy beef tongue, I'm sure you will enjoy their food. 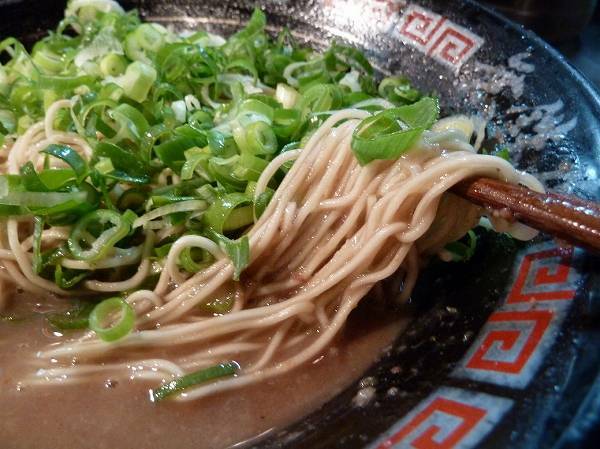 When you think of food from Kyoto, most Japanese people think that its light and not salty, but when it comes to ramen its totally the opposite. 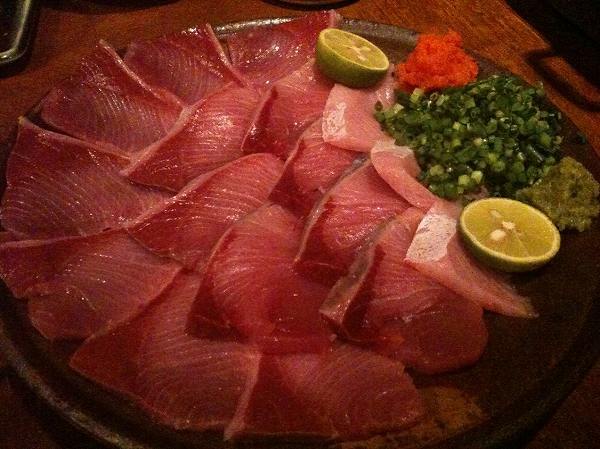 Its heavy, oily and tasty. 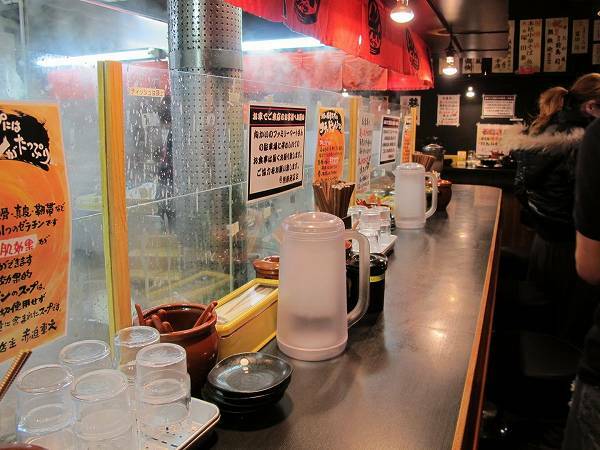 A ramen shop from Kyoto opened in Tokyo a couple of years ago and it has gotten many people addicted. 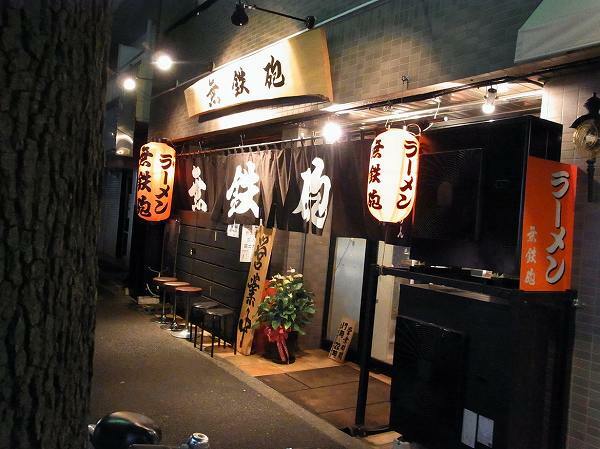 This ramen shop is MUTEPPOU at Numabukuro. 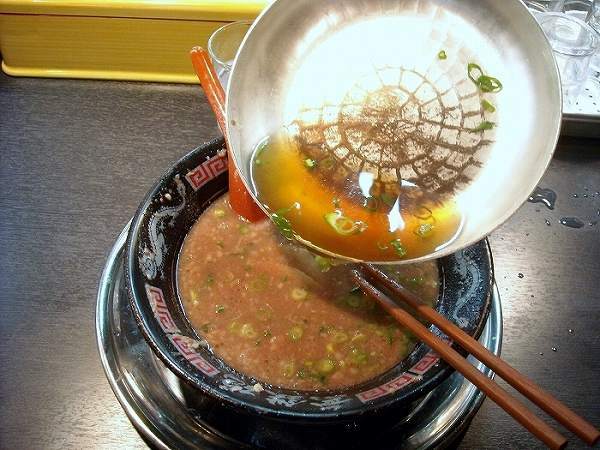 Muteppou's broth is made of pork bones and water only. 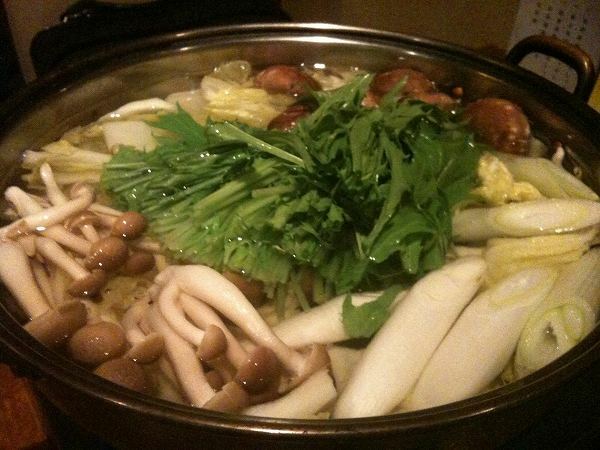 It is boiled until the bones are completely crushed and the chef is constantly mixing the bones or broth using a huge stainless steel stick. 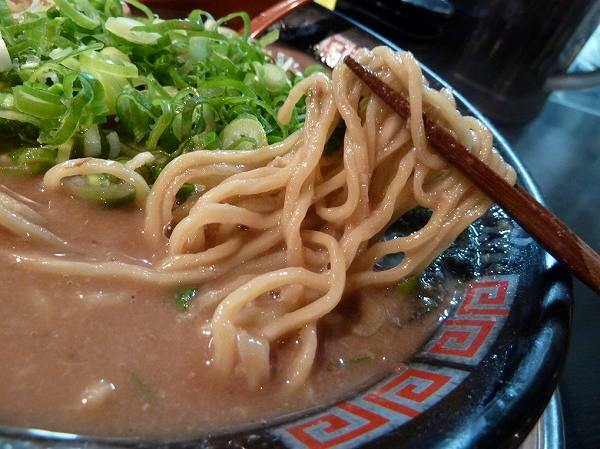 The regular ramen and most popular one is TONKOTSU RAMEN (Pork bone broth ramen) for 750 yen. 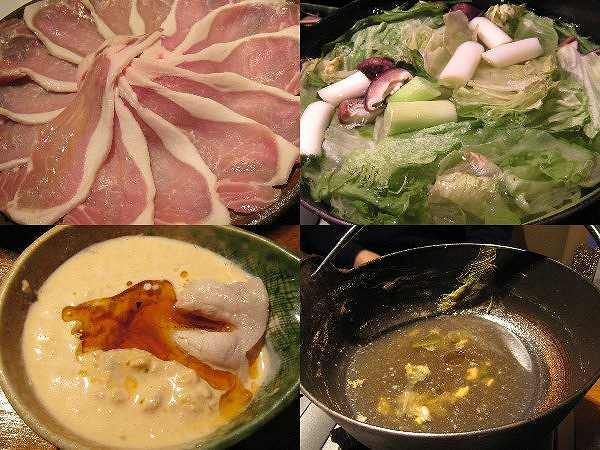 It has couple of slices of chashu (boiled pork) and large portion of Kujyonegi (Spring onions of Kujyo, Kyoto) on top. 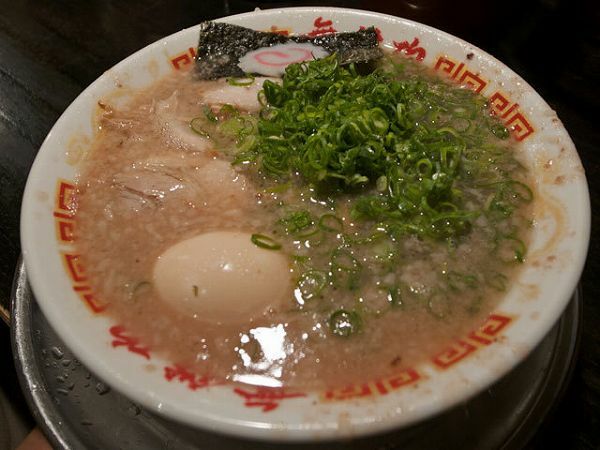 The broth is extra thick and rich and different from Hakata-style Tonkotsu ramen. 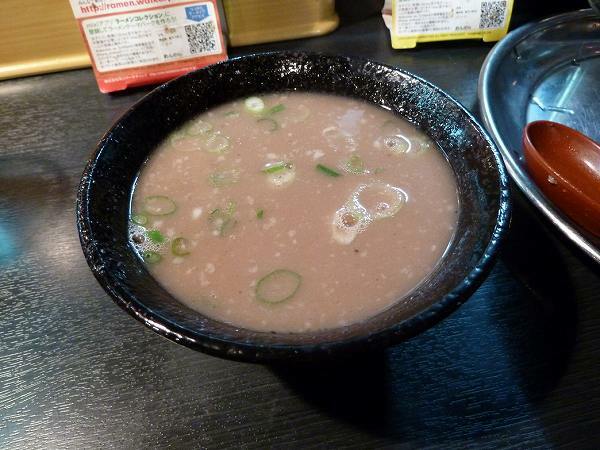 or more TONKOTSU SOUP (Pork bone broth) to your broth. 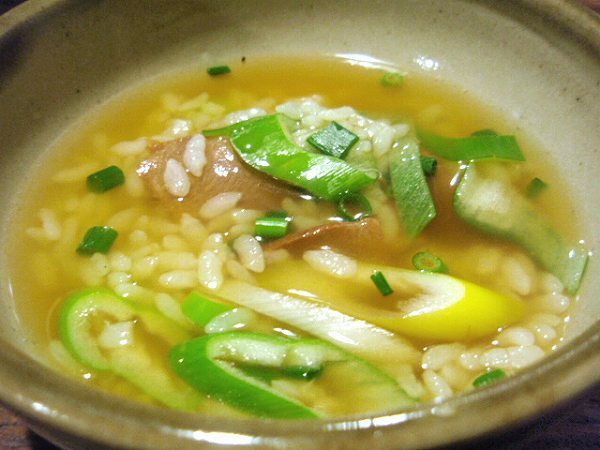 This additional broth is an original of Mutteppou. 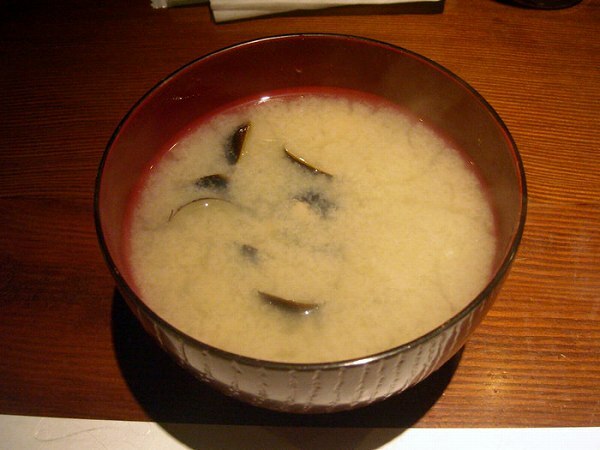 Some people add rice to the broth and make rice gruel to enjoy all of the soup. 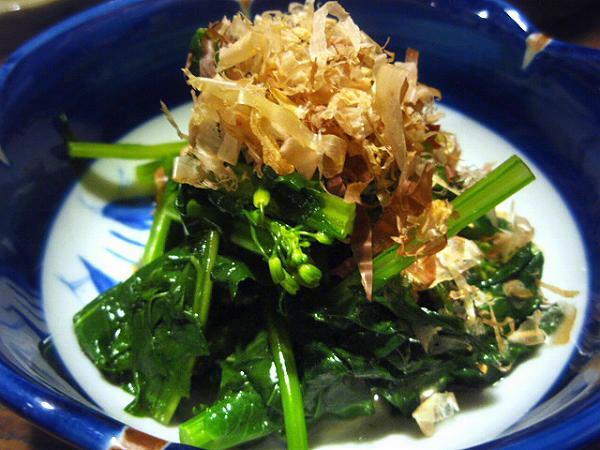 You can also order addtional Kujyonegi (Spring onions of Kujyo, Kyoto) for 200 yen. 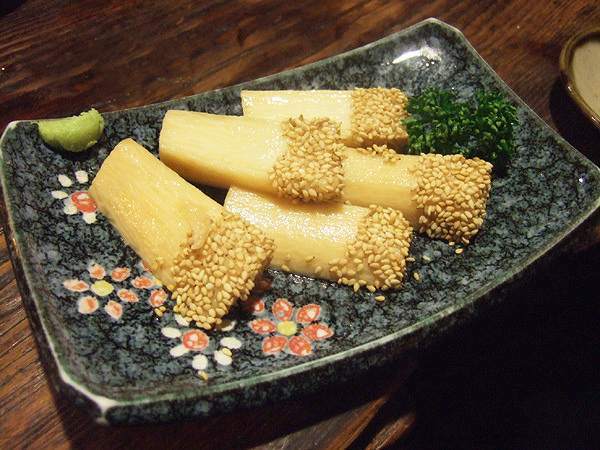 Kujyonegi is sweeter than regular spring onions, which makes the broth mild as well. 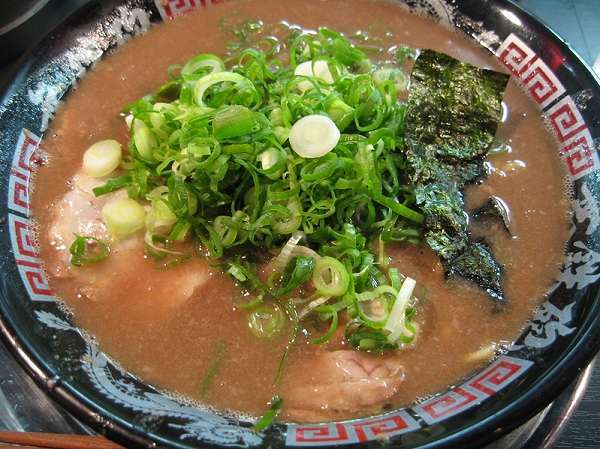 If Tonkotsu ramen is too heavy for you, they also have lighter ramen, SAKANA SHOYU RAMEN (Pork bone & fish broth ramen) for 750 yen. 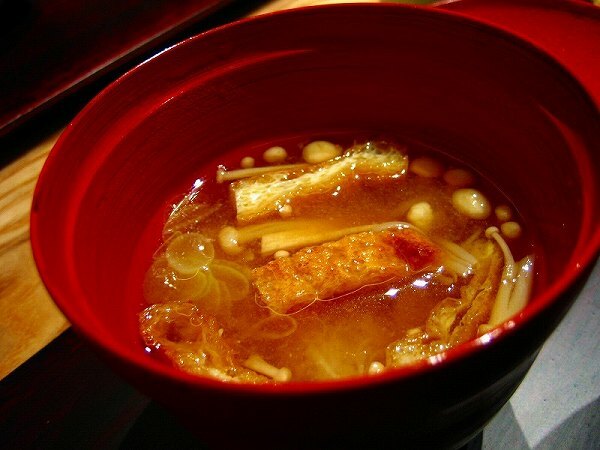 The broth is a mix of pork and clear fish broth. 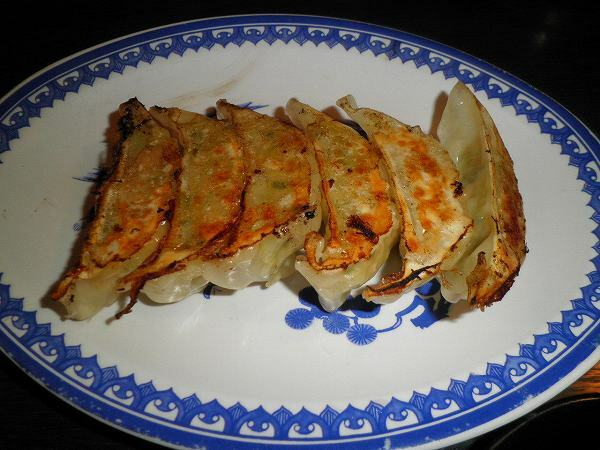 If you want to order any side dishes, their GYOZA for 400 yen are pretty good as well. 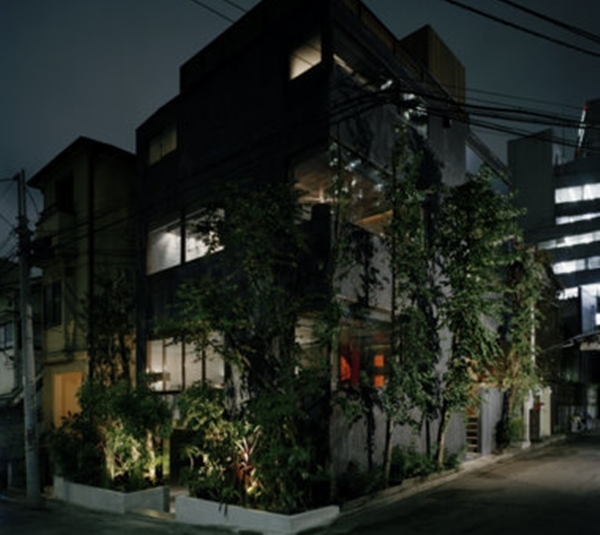 Muteppou is located at Numabukuro, which you take the Seibu Shinjuku line from Shinjuku and once getting off the train its still a good 8 minute walk from the station. 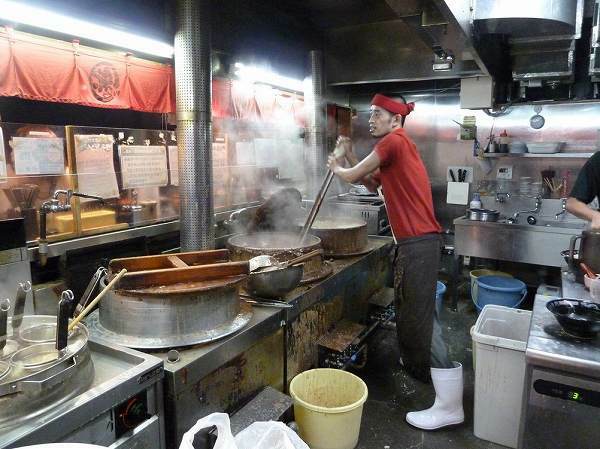 When famous ramen shops outside of Tokyo open a shop in Tokyo, they usually open one at or near a big train station. 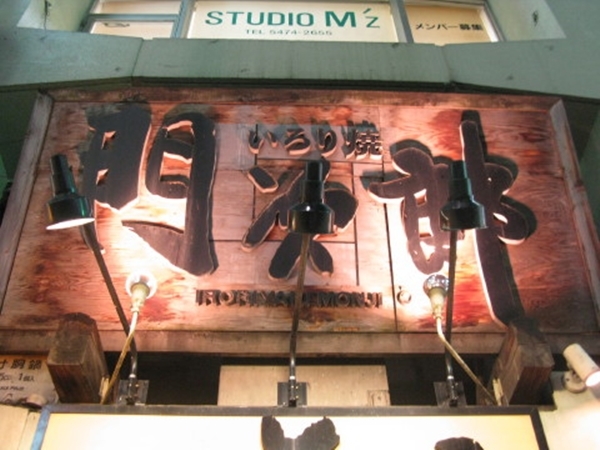 But Muteppou decided to open it in a middle class residential area far away from the nearest train station, and even without any publicity it still became one of the busiest ramen shops in Tokyo. 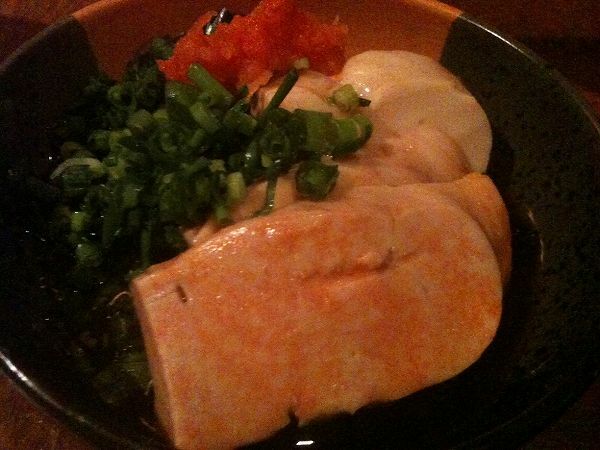 Since its heavy and oily this ramen is not for everyone, but if you wanna try something different, check Muteppou out.